As Kent’s largest mini coach operator, we have the capacity to deliver first-class, bespoke, corporate travel services. We cater to a wide variety of travel hire needs, however complex. Britannia Coaches boasts nearly 90 years of experience in the transport industry. Our corporate travel booking team draw on a wealth of knowledge to ensure your business trip is a success from start to finish. We provide corporate travel services on both a local and national basis. Our experienced operations team can give you help and advice with planning itineraries, routes and travel times. They can also tailor our services to suit your travel budget. 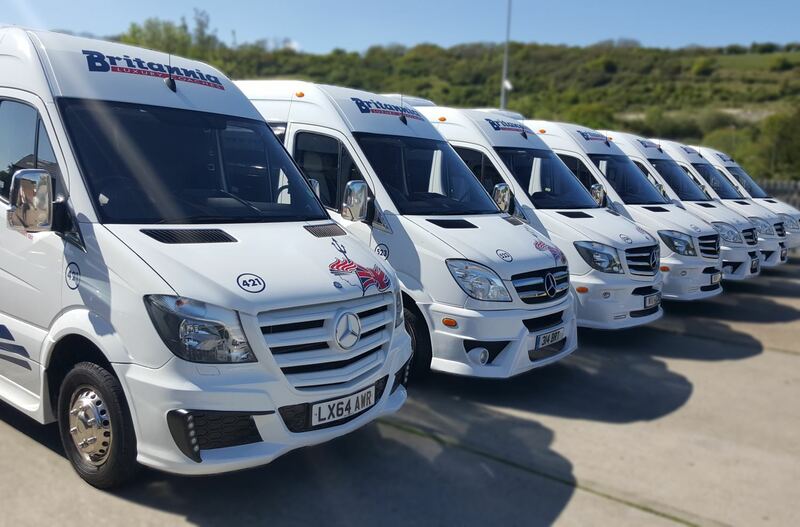 Britannia Coaches offer a variety of short-term and long term mini bus hire services. We can provide mini bus hire for corporate events or ongoing transportation services. We take travel safety very seriously, which is why we employ real-time satellite tracking of every vehicle. We make sure we are in touch with our fleet every step of the way. Direct access to the tracking software can be provided to each passenger via smartphone or another internet-enabled device. Committed to reducing our carbon emissions, Britannia Coaches uses GreenerfleetTM from Masternaut. GreenerfleetTM ties vehicle movements and driver behaviour together to provide a complete breakdown of our fuel usage, so that we don’t waste a drop. We understand the importance of business presentation, for both ourselves and our corporate coach hire passengers. We ensure that your vehicle is properly maintained, so that you can arrive relaxed and prepared. Our offices and mini coach hire team are the backbone of our commercial operations. With Britannia Coaches, you will have a corporate travel consultant who is there to provide you with the support and expertise to ensure your journey is a worry-free, comfortable and convenient experience. Employing full-time admin, accounts, I.T and Traffic Operations staff. We recognise that each driver is a critical element of our mini bus services, which is why we provide ongoing investment in their training. Thus, we stand proud as one of the first, UK mini bus hire operators who has put all their staff through the new Drivers CPC training. Has a current Enhanced Criminal Records Bureau (CRB) check and has received KCC approval to work with children. Please contact your corporate travel consultant to discuss our travel services in more detail.